By Todd Abelson NMLS #180858 on August 6, 2018 . The stock market posted modest gains this past week, as did mortgage bonds, while the 10-year Treasury yield pulled back on Thursday and Friday after hitting the 3% mark intraday on Wednesday. This resulted in relatively stable equity, bond, and mortgage markets for the week. There were a significant number of economic reports released during the week headlined by the Federal Reserve’s monetary policy decision on Wednesday and the Labor Department’s latest Employment Situation Summary on Friday. As widely expected, Fed officials left interest rates unchanged to keep their target range from 1.75% to 2.00%. The Fed’s policy statement characterized the economy as “strong,” suggesting the Fed remains on course to raise interest rates two additional times this year. The Fed Funds Futures market is projecting the next rate hike will likely arrive at September’s policy meeting with a current probability of 93.6%. On the job creation front, the Labor Department released a “not too hot, not too cold Goldilocks” jobs report revealing a below-forecast increase in nonfarm payrolls of 157,000 new jobs vs. a consensus forecast of 190,000 jobs. However, June’s jobs number was upwardly revised to 248,000 from 213,000 while the three-month average of new job formation is trending noticeably higher. Average Hourly Earnings increased 0.3% matching expectations, and the year-over-year increase in Earnings held steady at 2.7%. The Unemployment Rate fell to 3.9%. Overall, the financial markets were pleased with this report. 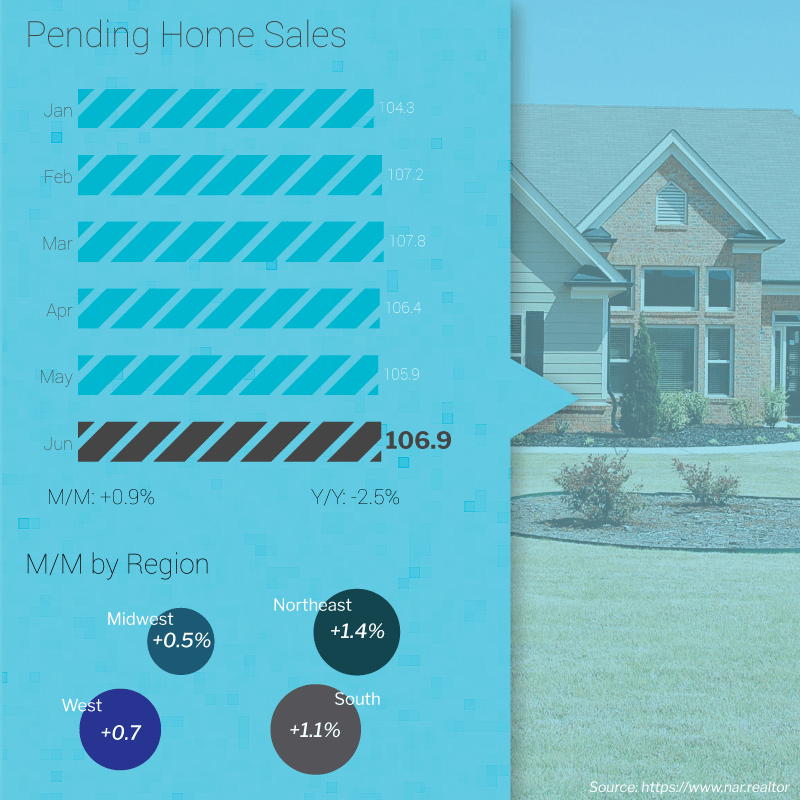 In housing, the National Association of Realtors reported Monday a week ago that Pending Home Sales edged higher for the month of June by 0.9%. This was a slightly better number than analyst expectations of 0.5%, but was 2.5% lower year-over-year. However, home inventory levels increased by 0.5% year-over-year, the first increase in three years, suggesting greater opportunities for future sales as many potential buyers are “waiting in the wings” to purchase a home. The latest data from the Mortgage Bankers Association’s (MBA) weekly mortgage applications survey released on Wednesday showed a decrease in mortgage applications. The MBA reported their overall seasonally adjusted Market Composite Index (application volume) fell 2.6% during the week ended July 27, 2018. The seasonally adjusted Purchase Index decreased 3.0% from the week prior while the Refinance Index decreased by 2.0% from a week earlier. Overall, the refinance portion of mortgage activity increased to 37.1% from 36.8% of total applications from the prior week. The adjustable-rate mortgage share of activity increased to 6.4% from 6.3% of total applications. According to the MBA, the average contract interest rate for 30-year fixed-rate mortgages with a conforming loan balance increased to 4.84% from 4.77% with points remaining unchanged at 0.45. For the week, the FNMA 4.0% coupon bond gained 10.9 basis points to close at $101.672 while the 10-year Treasury yield decreased 0.55 basis points to end at 2.9525%. The Dow Jones Industrial Average gained 11.52 points to close at 25,462.58. The NASDAQ Composite Index added 74.60 points to close at 7,812.02. The S&P 500 Index advanced 21.53 points to close at 2,840.35. Year to date on a total return basis, the Dow Jones Industrial Average has gained 3.01%, the NASDAQ Composite Index has advanced 13.16%, and the S&P 500 Index has added 6.24%. This past week, the national average 30-year mortgage rate remained unchanged at 4.72%; the 15-year mortgage rate fell to 4.18% from 4.19%; the 5/1 ARM mortgage rate remained unchanged at 4.00% while the FHA 30-year rate was also unchanged at 4.42%. Jumbo 30-year rates eased to 4.48% from 4.50%. 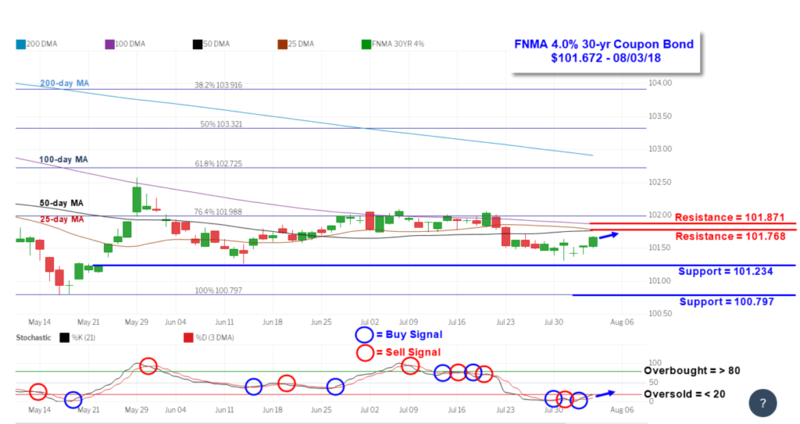 The FNMA 30-year 4.0% coupon bond ($101.672, +10.9 bp) traded within a narrow 37.5 basis point range between a weekly intraday low of 101.313 on Tuesday and a weekly intraday high of $101.688 on Friday before closing the week at $101.672 on Friday. Mortgage bonds remain “oversold” while trading in a familiar sideways pattern between resistance and support. The chart continues to suggest there will be stable to slightly improved mortgage rates this coming week.